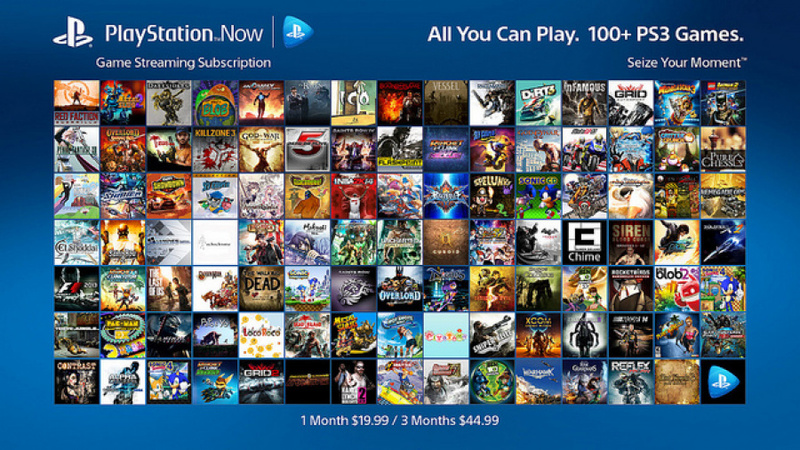 Sony's streaming service PlayStation Now was released in North America to an almost non-existent fanfare a few months ago, leaving us a little confused as to its long-term plans in the area. However, the platform holder has today arguably made large strides in the right direction, unveiling its subscription program – launching 13th January in the US – which will allow you to instantly stream any of over 100 PlayStation 3 games directly onto your PlayStation 4. There are currently two planned payment models: one month for $19.99 (£13.10), or three months for $44.99 (£29.50). What's more, the catalogue of games is relatively robust, including titles such as BioShock Infinite, The Last of Us, and God of War: Ascension. While a full list was not forthcoming, you can read more about the program through here. All in all, we reckon that this service is a fairly solid deal, especially if you value convenience, and plan to use it strategically as a means of padding out the leaner months. At the same time, though, many of the proposed titles will currently only set you back a few dollars anyway, making the pricing structure seem a bit steep. Are you likely to give this program a shot, or are you still not convinced that streaming is a suitable option? Broadcast your thoughts into the comments section below. I really shudder to think how DOA 5 and SSFIV are going to handle over a streaming connection. Otherwise it's nice to see such a large collection of AAA there and the subscription cost isn't bad but as someone that played most of what they wanted on PS3 it's not for me. I believe I will be subscribing. I enjoy the service and $19.99 a month for unlimited games seems reasonable. Not everyone will feel the way I do but let it be said, it's not that bad for unlimited access to 100 plus games. I think the value here obviously depends on how many games you plan to play. If you plan on going on a gaming bender for a month, then this would be the best way to do it. But if you just want to play one game, you'd obviously be better off either renting it from PS Now or just outright buying it. Probably the latter. I certainly think this is a step in the right direction , though. It's a much more tempting proposal than anything that had been offered previously. Much more appealing, but as Kell says you'd need to play a fair bit to get your monies worth... Now, can we have it in the UK please? @k_andersen aye, there are a few games I'd like to play that I didn't get round to, one month should be enough. Its a decent service but I can't see it taking off really. It would also be nice to be able to pay some sort of fee to play PS3 games I already own on the network. Not sure if this is for me or not yet but am looking forward to trying it out when available in the UK! This is definitely the right model now. It's probably a teensy bit too expensive ($15.99 p/month is probably about right), but I'll be interested to see how much interest there is in this now, considering everyone wanted a subscription. To me this is a great move by Sony - it is like Netflix but for games! There are some months when I do not use Netflix but I still pay to have it just in case I fancy watching something. It could be the same for this. So thats why EA Access was given the boot, or at least the real reason. There really should be free demo trial of one PS3 game so people could try if they can actually play streamed games without horrible input lag or bad picture quality. @get2sammyb Personally I think the price point will be spot on once the collection of titles on offer is widened just a little more. Getting the 3 month option works out at about £10 a month, the same as services like Spotify, which I reckon for unlimited access to a large chunk of the PS3 back catalogue isn't bad at all. If they properly prioritise which games they add to the service (pulling in all of the big exclusives first), then I can see this really taking off with the people who have switched from Xbox. Only concern is that Sony may shy away from doing that, as it could hurt sales of any PS4 remasters / collections they plan to throw together (such as the near inevitable Uncharted collection). It would be a shame to see them detract from their own service for the sake of some extra cash in the bank. Being able to just stream some games from my PS4, Vita, or Vita TV rather than dealing with updating and connecting my PS3 sounds awesome. I'll admit that the prices do seem a TAD steep and accessing the games does take longer than I'd like... but it's a very promising start. I'd like to see some type of PS+ integration in the future. Er erm anyway sounds cool, just waiting for it to come to the UK. Add Uncharted 1-3 and I might bite for a few months. However, my backlog of games is already so huge that I don't need to be paying $45 every 3 months for even more games. @calin1010 You'd have a point if this was being billed as backwards compatibility, but it's not. It's a separate, opt-in service that happens to allow you to stream PS3 games on your PS4 if you want to pay for it. When you purchased your PS3 games, Sony was never under any obligation to make them work on the PS4 as well. It's nice when it happens, but unfortunately, your PS3 games were bought to run on your PS3. I'ld say the price is fair for 100 games. Gamefly - FYI game disc rental service in the US - is $14.99 per month for 1 game out at a time, $22.99 for 2 games out at a time. Considering their long mail turnaround times this looks like a bargain even at $20 month. And as @ZeD said it's only $16 for the 3 month rental. I tried the free beta on my PS3 and hated it though. My biggest complaint was the lack of permanent save files. If you played a game and like it and decided to buy it as either DL or disc you coudlnt' continue from your save point. This being PS3 games on a PS4 that may not be an issue, but it bothered me. And of course the lag, which on some games was horrendous. I'd say for Xbox360 owners who have upgraded to PS4 and missed alot of these it may be worth a 3 month subscription for God of War, Uncharted and a couple of others. And it does say "free trial" at the end of the video for those who want to test it out first before ponying up. Will not be diving into this due to not having a great internet speed. If two people running Netflix in my house slows down the internet, then I can not imagine how streaming games will affect my gameplay. This is a step in the right direction for Sony though & hope they can make more money off of the PlayStation brand by including this on Smart TV's and tablets. @Bad-MuthaAdebisi You're right. I think the fact that Sony is only offering 1 and 3 month services (and not full 12 month ones like with plus) is because they aren't expecting people to stay permanently subscribed. Personally, it's the sort of thing I'm liable to use every so often, but I doubt I'd ever use it for longer than a month at a time. When your internet connection barely hits 5mbps on a GOOD day, Streaming becomes less of a reality. So let me get this straight. For roughly £13 I get access to 100 games that I can play as much as I want for a whole month? and EDF 2025 is one of them!? Bargain. Honestly, considering £10-£15 is the average price for a single decent preowned game in the UK, paying that much for access to 100 for a month seems good to me (plus I have 100mb fiber, so no connection issues there) and the genre range in the titles is decent too. Any idea when its out in the UK? @DarkJamD The PS Blog site says you can sign up for a 7 day trial once it launches. If they add ps2, ps1 and ps4 games, and I cant use psTV for it, I buy it. I'd certainly consider it whenever it comes to the UK. Plenty of great PS3 games that I missed, especially for the last couple of years. Hopefully the UK pricing will be as listed above. I would love this if the library were extraordinarily deep. I'm still holding onto my 60GB FAT model PS3 to keep playing my old PS2 games. If I didn't have to do that anymore, then yeah, I'd use this service. Very interested, but I'm gonna wait for PS Vita support and a PS+/Now bundle price. My at home gaming time has dropped in the last few years and its not worth it, to me, without mobility. Hmmm. Interesting. If there were enough games I wanted to play, I'd definitely give it a shot. What about Vita? Will this be for that too or just a PS4 thing? Not sure how well my internet would work for something like this, so I will probably not give it a go for the time being. However, I feel some will really enjoy this. $44.99 for only three months? No, just no. It this was $50 per year like PS Plus was, then perhaps I'll be tempted. But this will probably flop anyway. Are we able to unlock trophies? Price puts me off I'm afraid, I pay a yearly fee for PSN that's enough for me. Any word about us in the uk?? Biggest problem for me is the lag. I have an extremely high connection speed yet games still lag quite a bit. Even a little is enough to drive a person crazy. It's a good start, but they're gonna have to fix all of the lag before I consider paying money. That's why I don't use remote play with Vita, and this lags worse than that. I have to say as someone who didn't own a PS3 last gen this is a great idea to play some of the games I missed liked The Uncharted series, God of War etc. I am willing to try it out for a month at least. Any word on what games will be offered with the monthly subscription? I don't see how people can say this service's subscription model is too pricey when you compare it with the likes of GameFly, who provides you with 1 game rental @ $16/mo or 2 concurrent game rentals @ $23/mo. Having used GameFly in the past, I could say that the only benefit they offer over PS Now is that you can rent games for all systems and not just the PS3. Imagine having to pay that much a month and then dealing with long shipping times, poor title availability, and being stuck with your selection until you return it. 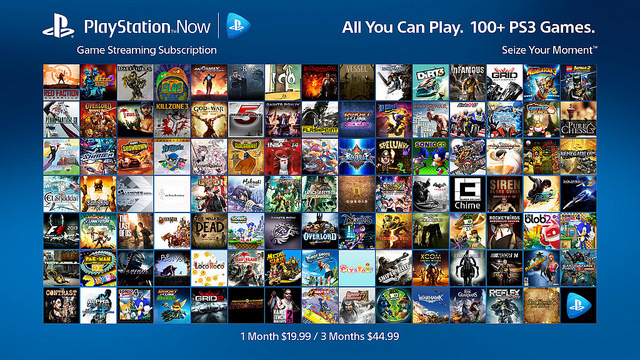 PS Now is a much better bargain when you consider that you can play games from their library on demand, and if you dislike a title you can just move onto the next one without having to return it first. My experiences in the closed beta were great. I didn't participate in the paid beta, though I have no problem jumping aboard with this subscription model. This isn't for me. I didn't have a PS3 and there was only a few games over the lifetime of the PS3 I wanted to play that were PS exclusive and I didnt play on my 360. Chances are they will come to PS4 anyhow. It seems too expensive for my casual gaming hands. I take ages to finish a game and feeling rushed just wouldnt sit well. A yearly sub in or around the cost of PSplus would feel more like Im not getting ripped off. Remember these are still older games. Their revenue line is finished. It really doesn't need to be so expensive for a short rental time. You can only play one game at any given time and there is only so many free hours in any persons day. My opinion is mute anyhow tho as Im UK based so it ain't available. Put this on Vita, with PS2 games too, and in the UK, and I would consider it. Ps3 games work for me as I went from 360 to Ps4. I like the idea, just not convinced on the cost. Not interested in the slightest. May be good for the odd month now and then when it reaches the shores of Albion but can't honestly see me ever touching it. Intrigued to see if the "lets port every PS3 game to PS4 because suckers will buy it" plan continues with this around. Clue: it will. I'd be tempted, but depends on if I can use PSN gift cards to pay the subscription cost. I don't have a credit/debit card, and I can't afford the activation fees for pre-paid cards.